Sticky Toffee or Blackberry and Apple, both are classic puddings, but in this instance I am talking cheese not pudding. The Sticky Toffee Cheddar Cheese was a gift from my sister following a recent trip to Derbyshire. 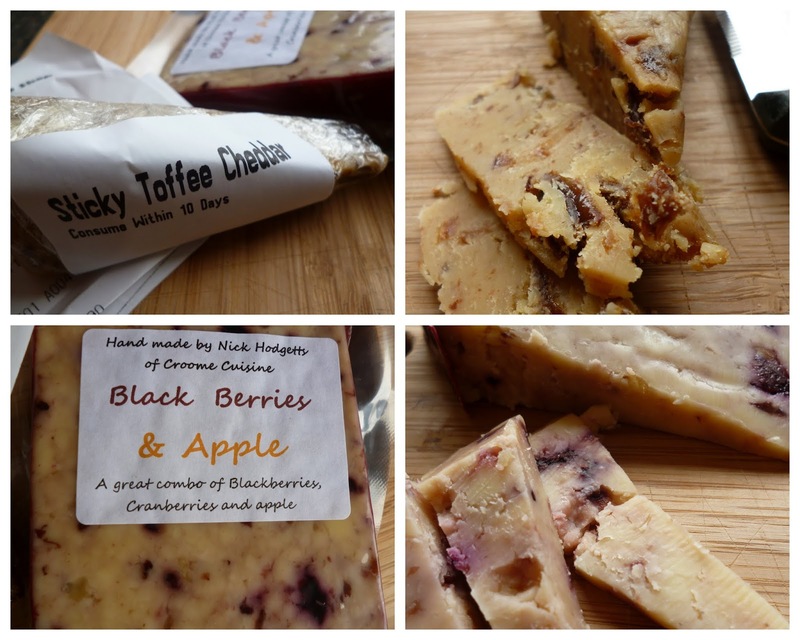 Whilst their she discovered Hartington Cheese Shop and their amazing selection of cheeses. Sticky Toffee Cheddar a great way to combine my love of cheese and puddings in one, it really was most enjoyable on a plain cracker. I am sure there are a number of you pulling a face at the thought of this cheese, but it certainly gets my seal of approval. The Black Berries and Apple cheese was a discovery at local food fair, they had a number of unusual cheeses all of which were available to taste - my kind of food stall. Maybe this cheese was a little less unusual than the Sticky Toffee, after all eating fruit with cheese and crackers is a great marriage of foods. Another tasty cheese winner in my eyes. Do let me know if you can think of a way I could incorporate these cheese into a meal or pudding. I think it sounds wonderful, but I am a bit of a sucker for cheese!